A couple of weeks ago while exploring Telegraph Rd. in Oakland, we stopped outside of a white house that appeared to be some sort of chocolate shop. Beta Wife and I stood outside discussing whether or not it was a good idea to go in, considering we’d just had brunch, when an apron clad, matronly woman approached us from inside. Very nicely, but firmly, she told us to quit loitering and come inside and buy some chocolate—and that we did. I think people can sense the fact that we have no will power when it comes to food. We are masters of the impulse buy and they can smell it on us. This little shop in the white house is called Hooper’s Chocolate Company. They have a counter that runs the length of their retail space, with milk chocolate on one side and dark on the other. They let you (or should I say, pressure you) into tasting their wares. It is almost impossible to leave without buying something, because really, who can resist a fresh box of assorted chocolates. And for extra credit, they donate 100% of their profit to the California Autism Foundation. 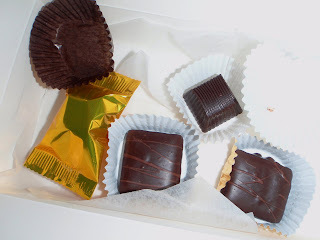 Hooper’s chocolates are made by Windsor Confections (they also supply The San Francisco Chocolate Company) and still make their products in the original Hooper’s plant in Oakland. My recommendations: the toffee squares, the rocky road squares, and the one with the rum in it.